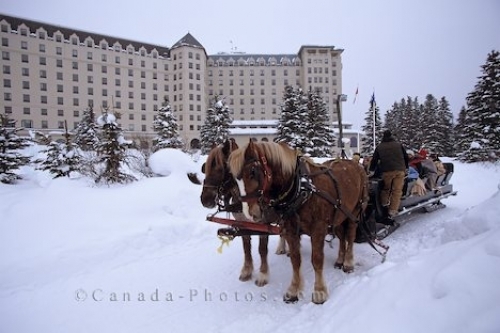 Horse buggy rides pass by the beautiful Fairmont Hotel in Lake Louise, Alberta in Canada. Winter is a beautiful time or year to travel around Lake Louise, Alberta and enjoy some sightseeing on the horse buggy rides. A guide will explain the different sights as you sit back and enjoy the scenery but be sure to bundle up warm due to the winter temperatures around Lake Louise. Picture of tourists enjoying horse buggy rides in Lake Louise, Alberta.